Blurb: Finally, the highly anticipated follow-up to the New York Times bestseller Beautiful Disaster. I’m not going to recap the book, because if you have read BD you know what happens. I’ve been trying to think of a way to review this book without upsetting anyone. 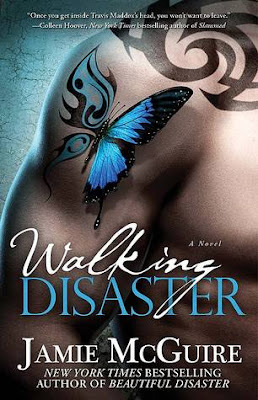 At the end of the day Walking Disaster was just as much of a rollercoaster ride that BD was. It has the same ups and downs, the same punched in the gut feeling, and I did enjoy bits. Jamie can write an emotional story that is gritty and raw and real-ish. There was never any doubt of that in my mind. People like Travis and Abby exist and get into these types of relationships all of the time. They just don’t usually get the HEA. Like never. Now we come to the brutal honesty part of my review, that will probably get tomatoes thrown at me. -First, This story is exactly the same as BD. Exactly. Sure we get to be with Travis when he gets the puppy, the tattoo, and the ring. But really I could have figured out Travis’s thoughts and feelings from the first book. -Second, the tone, and voice of Travis’ POV did not feel different to me than Abby’s. I wasn’t blown away by his insight. In a lot of ways it felt like I was simply re-reading BD. So I guess I had some expectations of what this alternate POV would be. I didn’t know I had them until I was finished with the book and I can’t single any of them out. Maybe it’s because I wanted to be blown away by Travis and understand why he is the way that he is, and I simply did not get that from this book. -Third, there is nothing in Travis’s past, as it’s presented, that completely justifies the way he is. Yes, his mom died when he was young, and for obvious reasons that marks a person. However, really? Lots of people lose parents at a young age. What I really wanted was to learn about the years that his dad “checked out”. Because I feel like those are the real years that formed Travis as a person. We get no more insight to that part of his life other than a few sentences here and there. -Fourth, and this is a biggy and one that sets me a part from the other masses of BD fans. I simply loathe Travis. The words, wanker and douche come to mind when I think of him. He reminds me entirely too much of my ex. So obviously this is a very personal thing to me. However, to be fair to Travis as a character, he is honest. So that is his one redeeming quality in my eyes. He is a scary character to be cast as a leading man. Women should really run far away from him. At the end of the day Walking Disaster was just an entertaining read, nothing more nothing less. So I am satisfied with spending my time with it. I just wish that it felt a little less like a re-read and a little more like a “fantastic new book”. Also, I might add that I LOVE Travis’s Dad, Jim. I’ve heard there will be a Trent book at some point and I am all over that. I think that Trent’s story will give me the fresh new insight into this world that I am looking for. the Amazon link is associated with my amazon associates account. If you purchase anything through this link, I get a minor kickback. This does NOT affect the cost of your purchase. The money (roughly under $2 a month) is used for the blog.